I’ve been spending a little time in ‘town’. We call town our nearest biggest city that isn’t anywhere near us. I guess Vancouver just has that power. But then again, so does Ikea. Who doesn’t get giddy at the thought of a trip there? I think it’s the promise of finding those perfect accessories to chime with your own given style. While they are modern, there’s always something that surprises me. 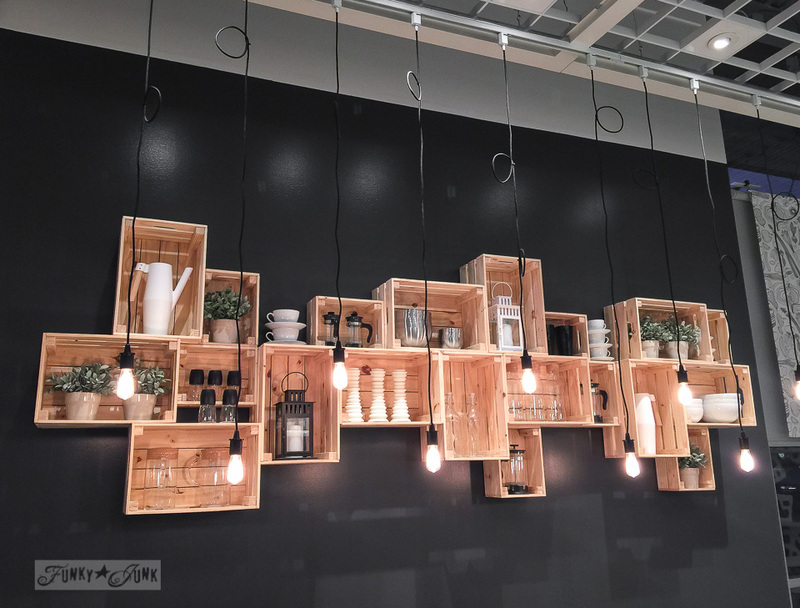 Take for example, this fabulous crate shelves display against that black wall. This made me want to rip out my upper cabinets, and install these well made crates! 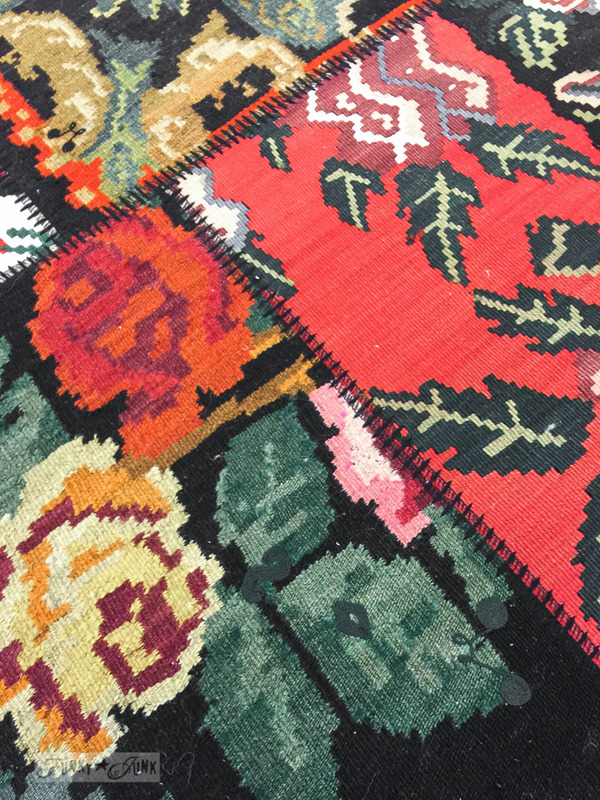 Never say never… such gorgeous styling. 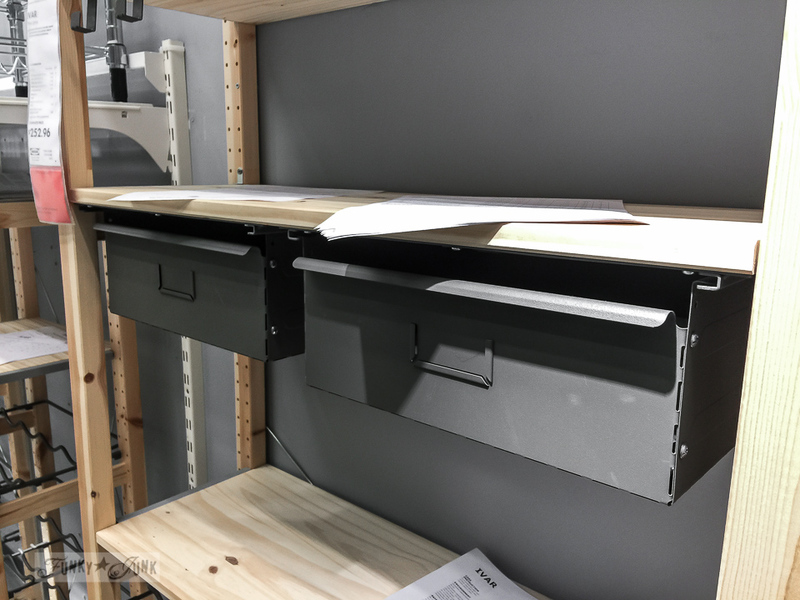 On the topic of storage, these metal shelves and brackets install under any kind of surface. How perfect is that? I have a few Gorm shelving units that would really put these to great use. Too bad they were sold out… I really wanted a couple for printing paper in my blogging office. Gee… guess I’ll have to make a return trip. 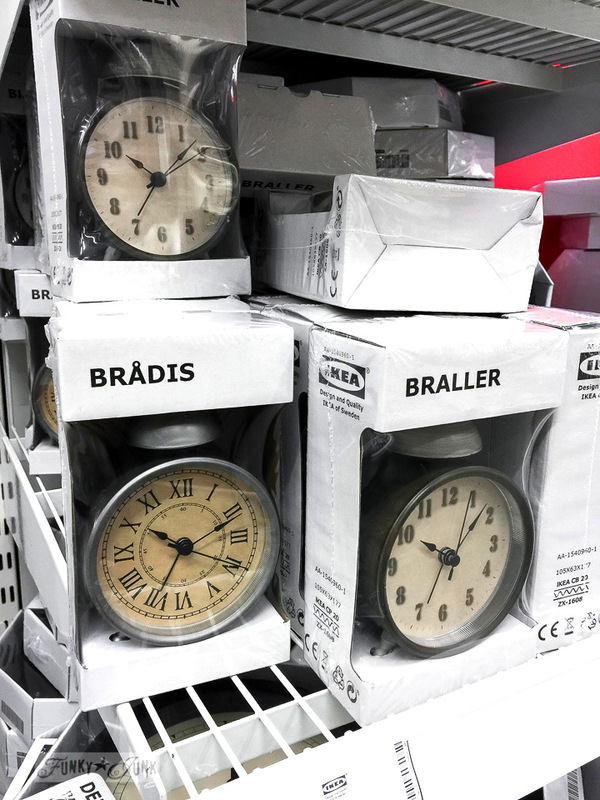 I loved how these clocks had an old vintage vibe. Now I’m questioning why I didn’t haul the grey metal one on the left home. 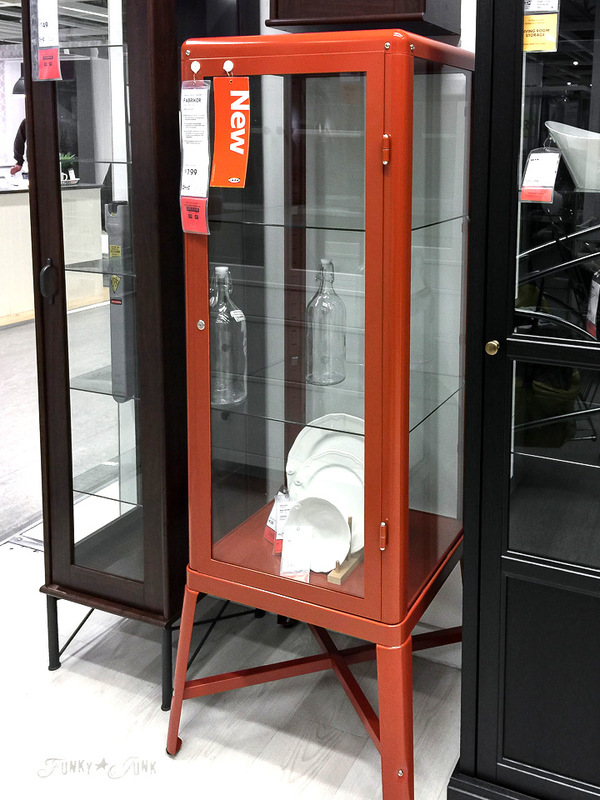 This burnt red metal cabinet (Amazon affiliate link) could have passed for a true vintage, if those top corners had been square. LOVED the look, especially the crossed supports on the legs. 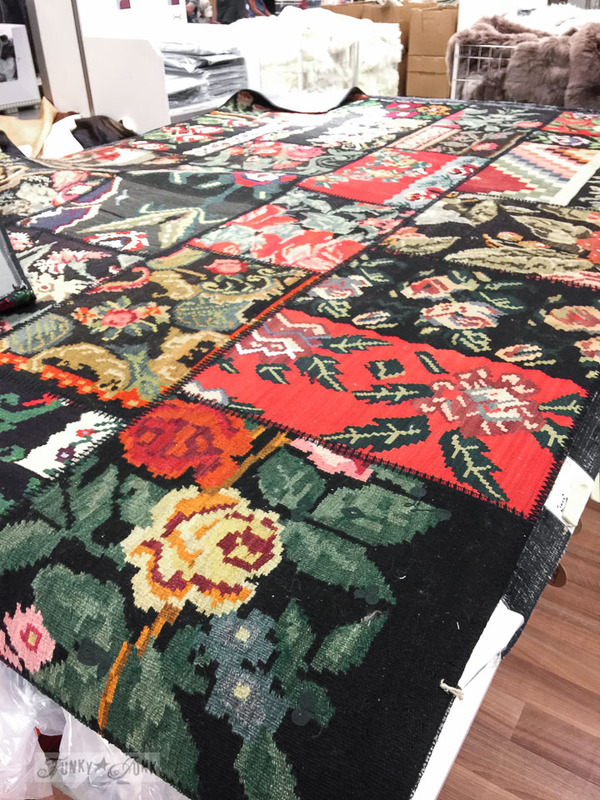 This tapestry styled carpet resembling a patchwork quilt was so charming. While it’s a little colourful for the way I decorate, I loved it. It would be fun to decorate an entire room working off this. The sections even had real stitching. Really well done! 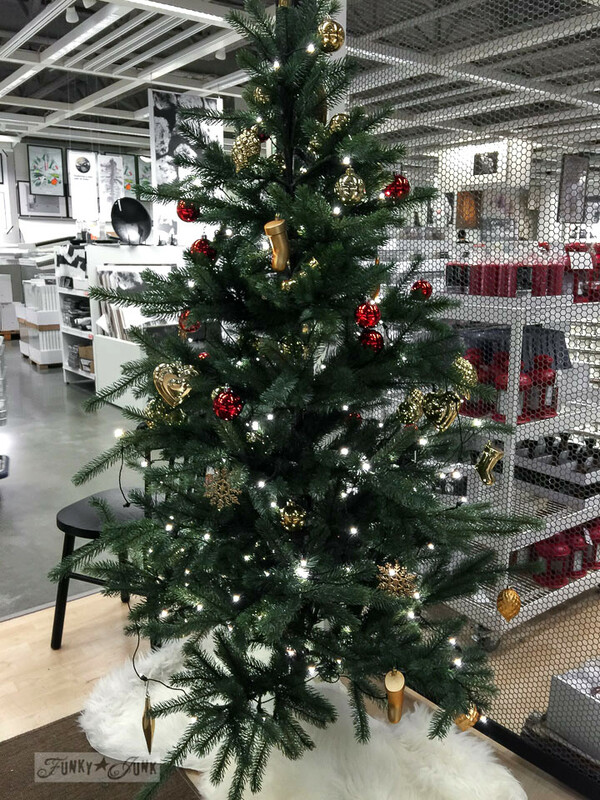 And if you go to Ikea now, you get treated to the new Christmas line! Loved these stars so much. Could I make them work in my little vintage world? I want the black! 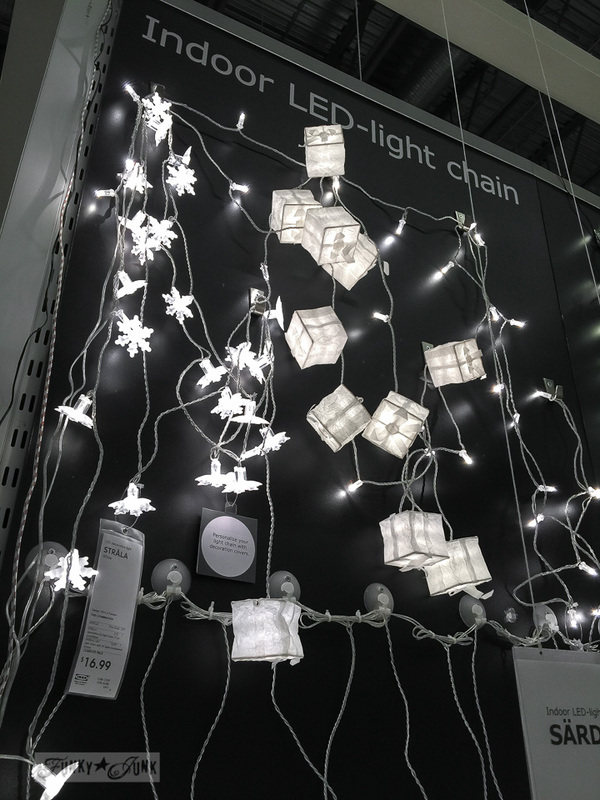 The little boxed presents in these LED lights made me smile. Too cute. In the plant section, they had these adorable metal buckets. I could see stencilling a few messages on these guys! The wooden handle detail was the perfect touch. Who else is dying to distress them a little, though?! 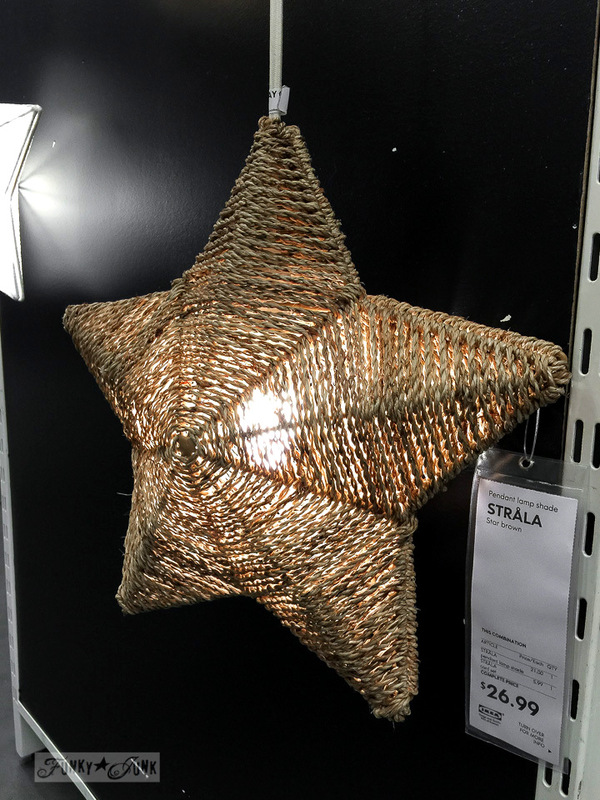 Oooo… a rustic twine looking illuminated star. Tempting. They look real from a distance, so I brought 3 home. I nearly passed by this tree, but then it pulled me back. See all those uneven branches sticking out? And for only $150, one came home with me. Yup, I guess I’m going faux this year. I just couldn’t pass up those perfectly imperfect branches. It looks more real in real life than it does in this picture. You just wait! But, I learned my lesson from my past visit here. If you don’t DART for the food from the start, you will miss out. I always seem to close the place down. So I head to the restaurant for the swedish meatballs. Sooooo delish! Do you get this all the time too? 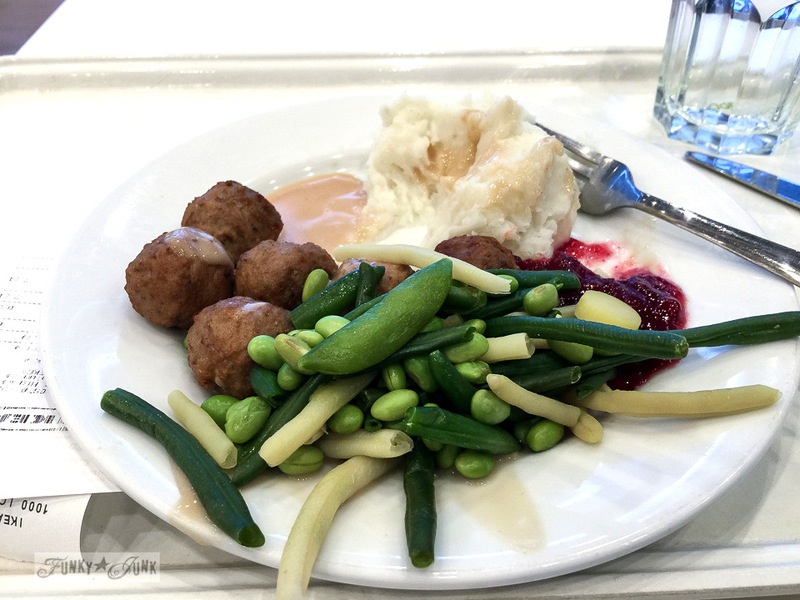 Funny story… I had this as a late lunch, and thought Ikea was open until 9, so I had planned to have it again for dinner. Only… they closed at 7, so I missed out! SEE? This is why you neeeeeeeed to eat first. And here’s where I played with the furniture. For HOURS. Oh boy, did the security camera (and staff) have fun with me that day. That crazy cat lady was fluffing and pushing and plopping pillows, blankets, furniture mixed configurations… so bad. So indecisive. So needed a good cat cuddle. I dreamed about it even! But I just couldn’t bring myself to fret over anyone wishing to actually SIT on it. Can you imagine? Ok, yes, dramatic, but still. I even gathered all these blankets I’d have guests sit on. Welcome to my home, BUT-SIT-ON-THE-BLANKET-K? So then I thought, if I had two of the dark chairs AND the white sofa…???? But the styles looked a little odd together. … and brought the entire store home with me. Which I will show you soon! Have you been to Ikea lately? What caught your eye in this grouping? I have two of the ektorp chairs with the tan woven looking slipcovers and love them. For my birthday, my sisters gifted me with the new light blue slipcovers! Love, love, love! Those will be my spring covers. Nice to have options. The chair stands up well to my nonslim family members and my guard-the-house at all times tiny dog and wash beautifully. Just be sure to put them on your chair/sofa damp. Stains came right off with stain removal treatment. how much fun! I don’t know if you remember, but Victoria had an Ikea waayy back. I’d go visit my Auntie and she loved to shop there. We have one not far from me…maybe I should venture out on a quiet Monday morning. 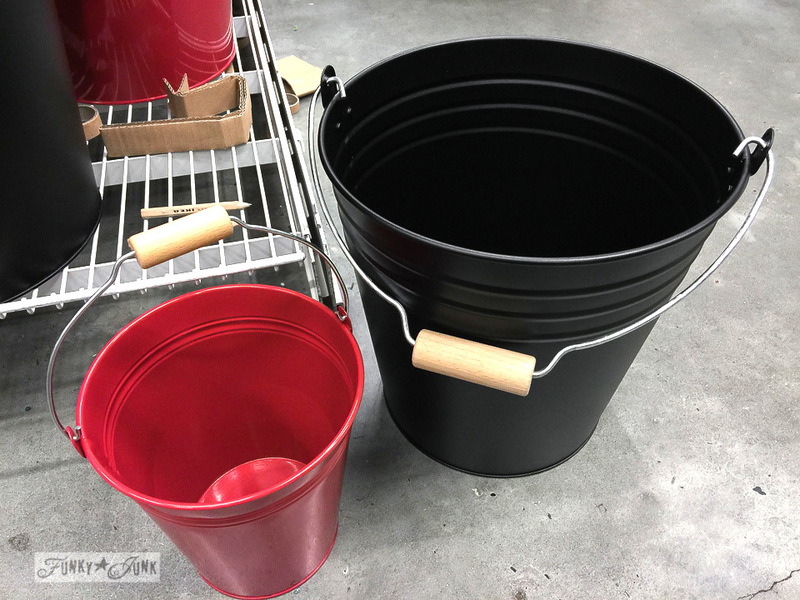 I love the buckets…bet they’re a good price and the red one would look cute with your snowflake stencil and a little distressing. 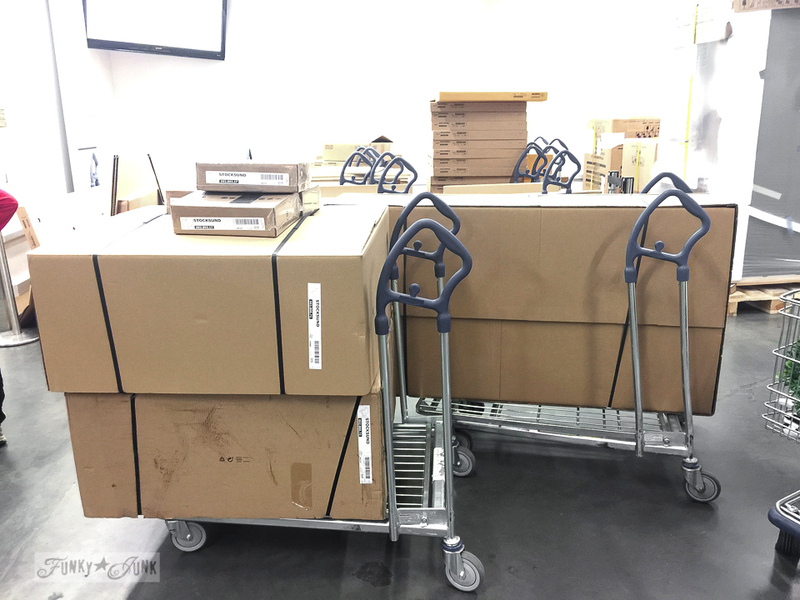 Thank you so much for showing the pics from Ikea! I have to go now! I just pinned a picture of a crate storage thingy and was wondering where I’d find the crates – these are perfect. 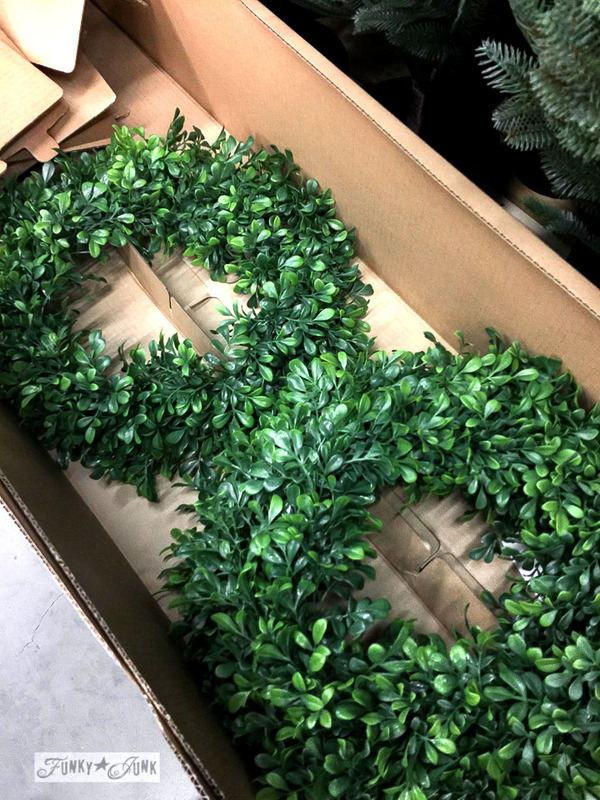 Also, I have been looking for boxwood wreaths for a better price than Target, and whoa, these are a fantastic price! I love your blog and all you do. You would be fun to shop with! Thanks for taking me along with you on that fun shopping trip! 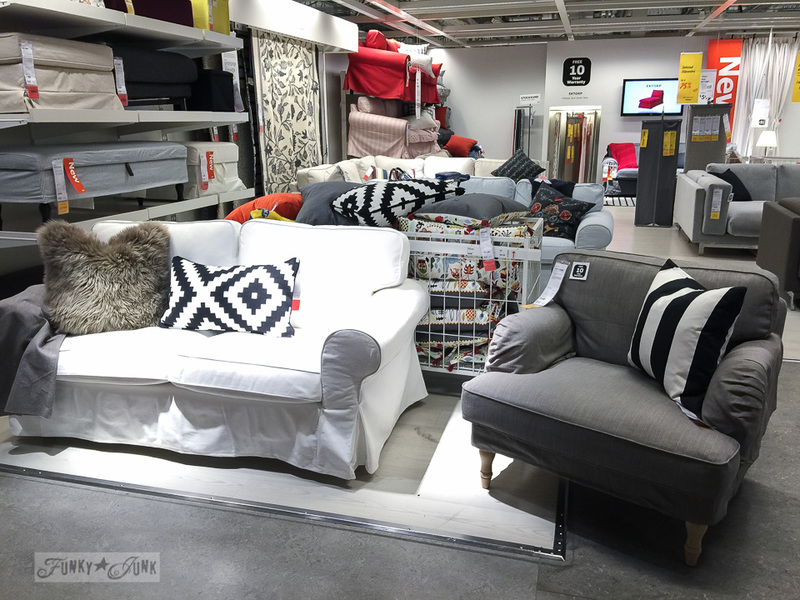 I lived near an IKEA my whole adult life and then we moved to a rural area, 3 hours from them….oh how I miss them! I read somewhere that the slip covered sofa is very comfortable and withstands all kinds of daily abuse….do you have experience with it? 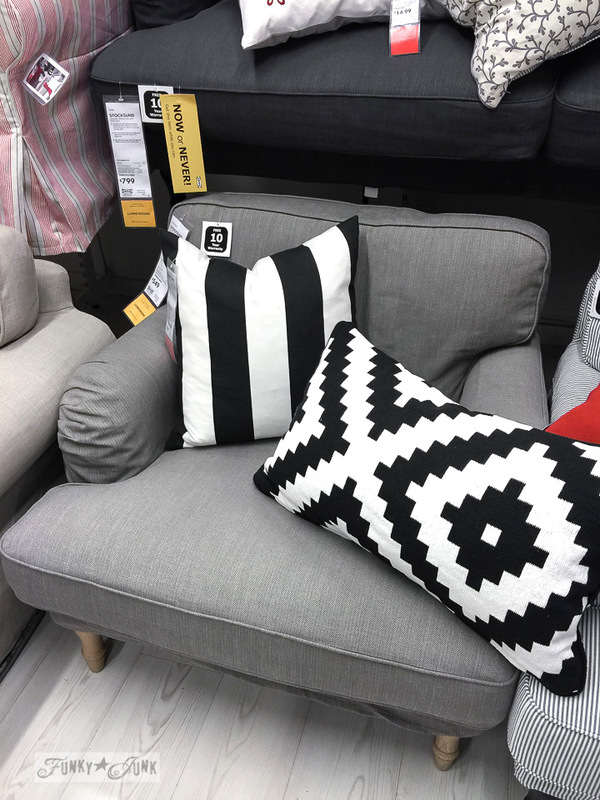 I am in need of a new sofa after the first of the year and don’t want to break the bank with the PB one….I may just have to make a trip to IKEA in the spring for that baby! 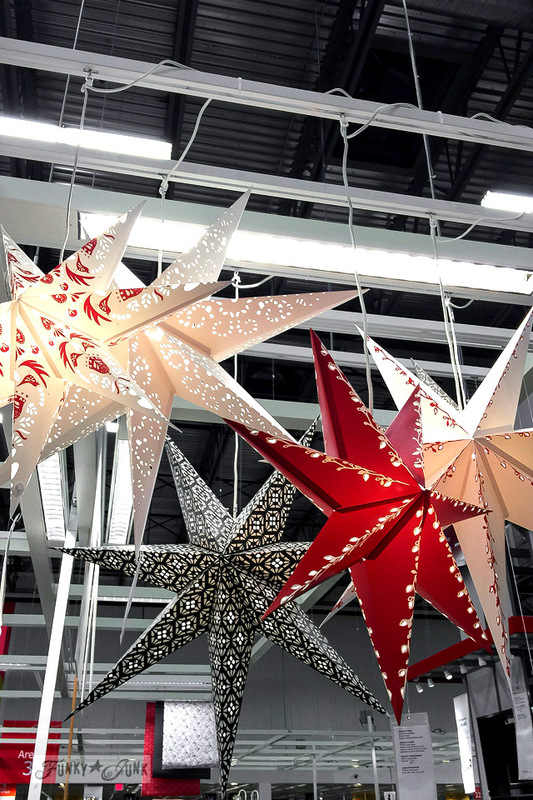 As for the Christmas decorations, OH.MY.STARS! I bought two of the biggest ones last year, they came in copper and are on stands….they looked absolutely stunning in my entry way! I can’t wait to put them out again this year. 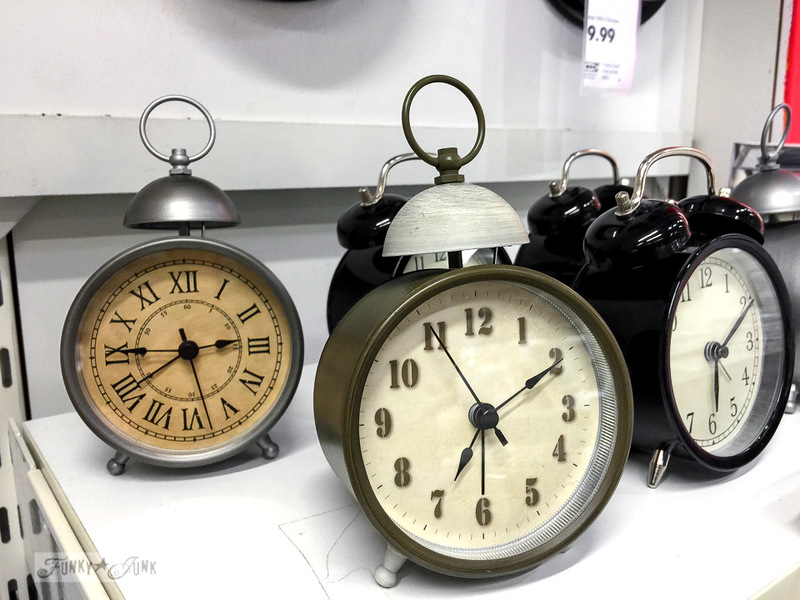 On to those adorable clocks….I need to get some, they are so cute! I do a display of clocks on my kitchen island (where everyone gathers, always) for New Years. I have a son that lives in another time zone from me, so I set a clock with our time and one with his…somehow celebrating his New Years makes me feel closer to him! IKEA never disappoints! Just wish my husband felt the same way, cuz I gotta borrow his truck when I go shopping there! I just happened to go to my local IKEA the day they finished putting out their holiday items ….n came home with buckets,wreaths ,faux tree , a few throw pillow covers ,n I never leave without a frozen yogurt and many ideas running threw my head….always a fun time ….enjoy your blog , look forward to how you will transform your finds. IKEA works for so many people, and some of their stuff is cool. Wish they offered more stuff in their catalog. Some items you can ONLY pick up in their store. I went to IKEA with a dear friend several years ago. She had a blast. We were there for 5 hours because you had to go through the entire store to get to the exit. I’m not the kind of shopper/consumer most women are so I didn’t say anything negative because I didn’t want to spoil the experience for my enthusiastic friend. I’m happy to say I didn’t. The one item I went to IKEA for was out of stock, and it couldn’t be ordered through the catalog. Happily, I MADE the item (a utensil hanger) myself from salvage materials. I still use it & still think it’s cool. I did that with the wooden cubes all around my living room in one of the houses I lived in.. I loved the look, this was in the 90’s and people always were in shock when they saw them.. Also, have done the quilt rug. really good if you need to change one out due to a stain. I love that chair.. Will have to take a look next time I am there. Have a great Holiday everyone. Everything caught my eye. We were spending a lot of time in New Haven CT at Yale/Smilow Hospital and always ended up at IKEA. I bought my husband a lounge chair and even carried it into the house by myself. We were there another day and they had their $90.00 butcher block counter tops on sale for $8.99. We bought three of them. I also bought some Christmas ornaments and I wish I bought more because the next time we were there they were gone. I truly love the store and the people are very nice. I have the couch you were talking about. I bought an extra slipcover and the one on there has to be changed. Just a little hint – the slipcovers are not supposed to be put in the dryer so I dry them on the line and then throw them in the dryer with ice cubes. They come out beautifully and can go right on the sofa. I put a quilt over the back and the seat not for company but for the two cats and two dogs. I am soooooo jealous you live so close to an IKEA. I was visiting my kids in Utah near Salt Lake City and was able to check out the store. Was a fun trip! I have been looking for the boxwood wreaths as another lady had mentioned. To expensive at Target so now I know where I can get them. Wonder if they will ship them? Happy Thanksgiving Donna to you and your family. Believe it or not, I have never been to Ikea. Not for lack of wanting to. It’s an awesome store and one day I will go. The only thing is could I trust myself to not buy out the whole store. The clocks were amazing. I have a thing for clock faces with the roman numerals. I’d like to paint one on my wall. Thank you Donna for sharing and have a wonderful day! I got my first taste of IKEA wen my daughter visited us in North Carolina from Ohio. They rented an extra long van for their big family. We took it to IKEA with us on a day trip. I wanted the Billy bookcases they had in various dimensions, and I couldn’t justify paying $350 for delivery. We started at the beginning, and it was amazing. Of course, we took out time to eat also. We had a great time. I can see using them again somewhere down the line…maybe when redoing the kitchen?? ?